What is human morality and how does it affect (primarily American) politics and religion? In his book The Righteous Mind: Why Good People Are Divided byPolitics and Religion, social psychologist Jonathan Haidt purports to answer that question. Despite having conducted extensive psychological research, however, Haidt ultimately fails to deliver a satisfactory answer. In part, the failure is attributable to a rhetorical trick on his part — that is, the withholding from the reader until nearly the end of the book the fundamental premise upon which his conclusions are based. And even then, he does not provide what he promised: a definition of “morality” upon which to base his discussion of how “morality” impacts politics and religion. Which sounds like a definition written by a group of politicians or lawyers! … where morality is defined as “a doctrine or system of moral conduct” or “conformity to ideals of right human conduct”. And I say “under the existing circumstances” despite the criticism often leveled at the term “situational ethics”, because what may be the “moral” course of conduct in one situation may not be acceptable in another. The most obvious example of the circumstantial nature of morality is in the killing of another human being, which most people would agree is generally immoral, but is acceptable in self-defense. The book is also somewhat tough going because Haidt writes in a rather esoteric and somewhat pedantic style. For example, he slavishly follows the timeworn advice, “Tell them what you are going to tell them; tell them; then tell them what you have told them”. While this might (or might not) be a good approach to making a relatively short oral presentation, the repetition gets downright boring in a book as lengthy as Haidt’s. I have a fundamental disagreement with Haidt and his compatriots with respect to their conception of “morality” as necessary and appropriate “to suppress or regulate self-interest and make cooperative societies possible”. In other words, and in the modern context, to make us compliant with the will of government. 1) Care/harm: I accept and agree with the observation that how we care for and avoid harm to others (human and animal) is a fundamental aspect of morality. Under most circumstances, caring for others is the “moral” (or “right”) thing to do. This, of course, is particularly true with those closest to us, our family and friends. It is also true of our pets. To the extent that each of us is capable of doing so, it is also true with respect to others we do not know personally. We exhibit our morality in this regard by making donations to charities, assisting others in time of need, buying cookies from local girl scouts or even such simple acts of kindness as holding doors for women and stopping our cars for people crossing the street. 2) Fairness/cheating: While I also agree that treating others “fairly” and not “cheating” is “moral”, I am not sure that this isn’t just an alternative or particularized formulation of the so-called care/harm “foundation” — we “care” for others by treating them fairly and we avoid harm to others, at least in one limited respect, by not “cheating” them in our dealings with them. On the other hand, I’m not convinced that concern for either “equality” or “proportionality” is properly considered an aspect of morality. In a political context (to the extent that politics has anything to do with morality), treating others “fairly” does not necessarily mean treating them “equally” … or even “proportionately” (whatever that means). Whether or not any individual or group of individuals can achieve “equality” or “proportionality” is an amoral concern; that is, the end result is not a moral consideration at all. 3) Liberty/oppression: Once again, it seems to me that this “foundation”, as defined by Haidt, is just a particular application of the “care/harm” foundation. Someone who “dominates” others and “restricts their liberty” is harming them, psychologically and emotionally at least, if not physically or materially. “Bullies” and “dominators” are people who fail to care for others and intentionally harm them. In the political context, giving moral people the liberty to do what is right will generally result in them doing so. 4) Loyalty/betrayal: While I agree that matters of loyalty and betrayal can be matters of morality, it seems to me that they become such only when an individual has made a commitment of some kind to others. And even then, this is once again just another expression of the care/harm foundation. Take for example the most basic human relationship — male and female. Once committed to each other, a man and a woman have a moral duty to maintain loyalty to that commitment (that is, to care for and avoid harm to the other). Failure to do so by harming the other in some way, would constitute a betrayal of that commitment. Similarly with respect to parents and children; by having a child, a parent makes a commitment to care for and avoid harm to that child. Maintaining loyalty to that commitment is morally correct; failing to do so would be immoral. On the other hand, no one has a moral obligation of loyalty to any other person or group of persons with whom he has exchanged or made no individual commitment. And no person or group of persons can impose such a commitment on any other person against that person’s will. Doing so, using Haidt’s terminology, would constitute “bullying” or “dominating” and would itself be immoral (“harmful”). Under such circumstances, there would be no moral imperative to maintain loyalty or avoid betrayal to the bullying or domineering person or persons. That would be me; in fact, I consider resistance to authority to generally be the “right” (and therefore moral) thing to do under many circumstances. The reason is actually quite simple — if the “authority” is seeking moral conduct, then any individual should act accordingly on the basis of that individual’s own moral code; no imposition of “authority” is necessary to achieve the desired result. On the other hand, if the “authority” is seeking conduct which is immoral, any individual acting in accordance with the dictates of that authority would be acting immorally. Doing what is “right” under those circumstances requires one to resist that “authority”. A single word makes the point clear: Hitler. In other words, no degree of “authority” can make moral what is not; to make right what is wrong; or to justify what is not right under the circumstances. Therefore, “authority/subversion” has no bearing whatsoever on one’s individual morality. 6) Sanctity/degradation: Similarly, I reject the idea that “religious notions” have any bearing on morality. Just as no “authority” figure can make right what is wrong, no religious (“sanctity”) figure can make moral what is not or — as is more commonly the case with religion — make immoral that which is not. In fact, throughout human history, “religious notions of striving to live in an elevated, less carnal, more noble way” have more often than not been used by individuals or small groups of people to “bully” and “dominate” those within their sphere of influence and to impose the will of the minority on the majority. Furthermore, when it comes to the actions of any individual which might “desecrate by immoral activities and contaminants” the “temple” of that person’s body, there is no moral issue because such actions are (or at least should be) of no concern to anyone other than the individual involved. “Your morals” as defined by Haidt, of course. After finishing the book, I went to the website and completed the questionnaire. My results are reproduced below. 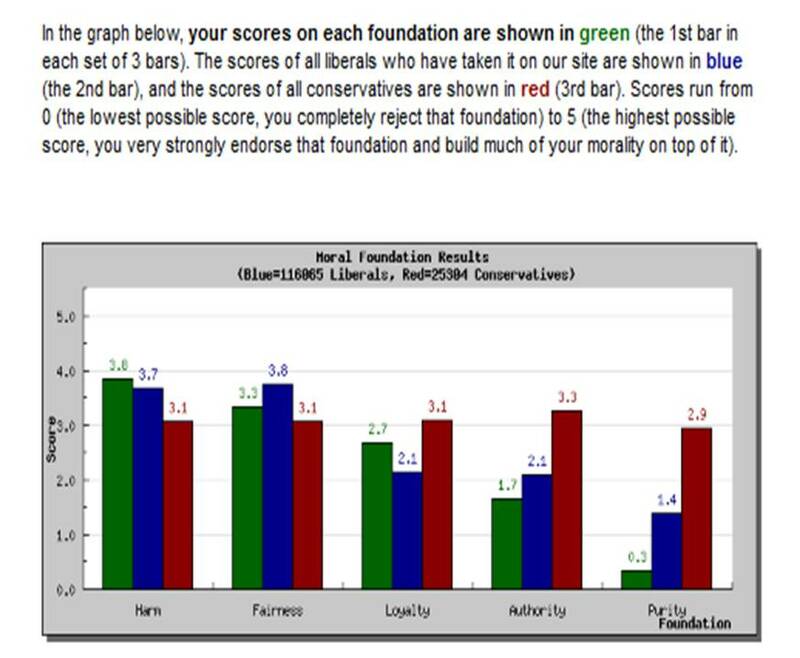 Interestingly, I scored higher than the average for both liberals and conservatives on the “care/harm” scale; between the two on the “fairness/cheating” (below liberals and above conservatives) and “loyalty/betrayal” (above liberals and below conservatives) scales; and below both on the “authority/subversion” and “purity” (“sanctity/degradation”) scales. The questionnaire, as currently constituted on the website, does not evaluate the “liberty/oppression” characteristic of the responses. It’s also quite possibly the biggest load of nonsense I have ever come across and the one piece of advice that, if followed, is guaranteed to make your next presentation a boring one. The simple format outlined above is great if you are a six-year-old doing show and tell at your school. It gives the little tike some basic structure to bolster their confidence and help get them through the dreaded five minutes they have to fill. If you are an adult, however, you require something more. Repeating something three times does not make it interesting or engaging. Nor does it make it memorable (particularly when your audience has nodded off in the first ten minutes). If you want an audience engaged and interested in what you have to say then you need themes and stories rather than mindless repetition.